Thomas Dolby recently tussled with one Kevin Federline over the use of an unauthorized sample of Dolbys song She Blinded Me With Science. A cease and desist letter had to be posted on Federlines MySpace page, when other attempts to contact him had failed. 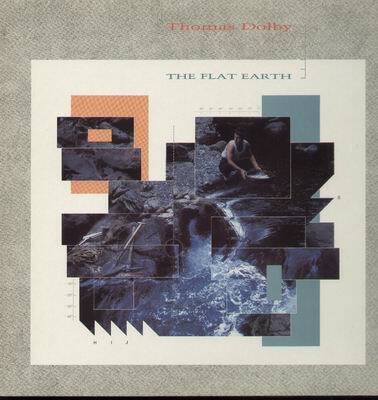 Here’s a clip of synthesizer enthusiast and early tech geek-muso Thomas Dolby with his 1984 album track and shining gem from his beautifully textured second album The Flat Earth , “Screen Kiss”. Dolby is of course probably best known for his ginormous radio hit “She Blinded Me With Science”, taken from his excellent debut The Golden Age of Wireless, released in 1982. In many ways, Dolby was an unlikely pop star, more at home in the studio building synths from spare parts and from kits, and drawing from his love of jazz more so than for straight-ahead pop music. But, I think it’s his background which made him so fascinating as a musician, and his varied interests in all sorts of genres helped to add something to his own albums too. Dolby intially honed his craft as a songwriter for other artists such as new wave diva Lene Lovich, and early hip hop crew Whodini. Both acts had chart action with Dolby compositions and co-compositions – “New Toy” and “Magic Wand” respectively. He was also an enthusiastic producer and session musician, working with acts as varied as Joni Mitchell (he was producer on 1985’s Dog Eat Dog ) and Foreigner (with whom he served as a session keyboardist on their 4 LP in 1982), Def Leppard, Robyn Hitchcock, and others. He would go on to work with luminaries such as George Clinton, Prefab Sprout, and Roger Waters later in the decade, among many others. All the while, Dolby was keen to write material for his own albums, building them up using synthesizer and sequencer technology, as well as drawing from his wide musical interests. His singles “… Science” and the follow-up “Hyperactive” aside, Dolby made some elaborately textured music even side by side with those pop singles, some of it being just as accessible (‘Airwaves’, which should have been a smash), and other tracks more experimental and angular (“Cloudburst At Shingle Street”, “Mulu The Rainforest”). His ability to write a hit single was proven, yet on his albums he was still interested in pushing the boundaries a bit. I think ‘Screen Kiss’ is one which strikes a happy medium between these two poles, with the wash of electronics that sound downright organic and warm, peppered with sparse piano voicings, Pastorius-like fretless bass lines, and a repetitive, hypnotic electric guitar riff. Lyrically, he manages to be interesting too, with a sort of impressionist take on a tale about ex-pats seeking and discarding connections while living in the darkly surreal Hollywood landscapes, seeming to celebrate appearances and lack of depth. It’s my favourite track off of a solid album, which despite using synths while in the mid-80s, manages to sound pretty timeless. And apparently, this is a song about a real person with whom Dolby was smitten, and by whom he was tossed aside, himself an English ex-pat in LA. The names were of course changed, to protect the jaded. Despite his singular voice and ability to craft sonically interesting records in a pop vein, Dolby didn’t regain the commercial traction of his first hits, with follow-up singles and albums less well received during the remaining years of the 80s and into the early 90s. But, he had plenty of other interests to hold his attention, including software development which occupied his time for a decade and a half following his success as a pop musician. He founded the software company Headspace, and then developed applications for sound compression for studio use. He formed a company called Beatnik, which focused on the development of mobile phone sound technology including polyphonic ringtones for Nokia. He was a frequent speaker at technology conferences by the early Twenty-First Century. All the while, he continued to write scores for films and video games. In 2006, he was back as a performer, and is currently working on new material while overseeing the remastering and repackaging of both the Golden Age of Wireless and The Flat Earth. For a peek into what Dolby is doing these days as a performer, check out this clip of Thomas Dolby performing the title track from the Flat Earth, giving you a close-up of his onstage set up as well as watching how he builds the track from the ground up in a live setting. This is another atmospheric track from a very good album that brings the influences of synth pop together with the unlikely bedfellows of soul and jazz. You can read Thomas Dolby’s blog, to find out about the remastering project, new music, and any number of things seeing as he’s as big a blogger as any of us, apparently! He was always a hero of mine when Ifirst became a music fan. And now thanks to WordPress, his “heroship” is assured.